At Dreamforce this week, Salesforce debuted its revamped marketing hub — now dubbed Salesforce ExactTarget Marketing Cloud — as part of its Salesforce1 platform. The Salesforce ExactTarget Marketing Cloud is designed to integrate apps for email, mobile, social, web and marketing automation, into a single location. The marketing cloud also is designed to provide a consolidated view of every customer, help manage the customer journey and optimize content for every device. InsideView has expanded its InsideView for Marketing solution with two new products, the company announced at Dreamforce. InsideView Clean is designed to update any existing marketing database with accurate and complete company and contact information. 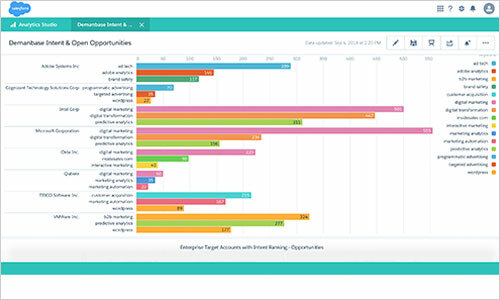 InsideView Target is aimed at providing highly targeted segmentation and list building based on company and contact data, key business events, social insights, or professional connections.